A funny thing happened. I left the country for three weeks and when I came back summer was gone. I’m totally in denial. This time last year, I was done with summer and was all about trying to lure fall to southern California. This year, I’m trying to get myself to let go of summer and get into the spirit of fall. Go figure. 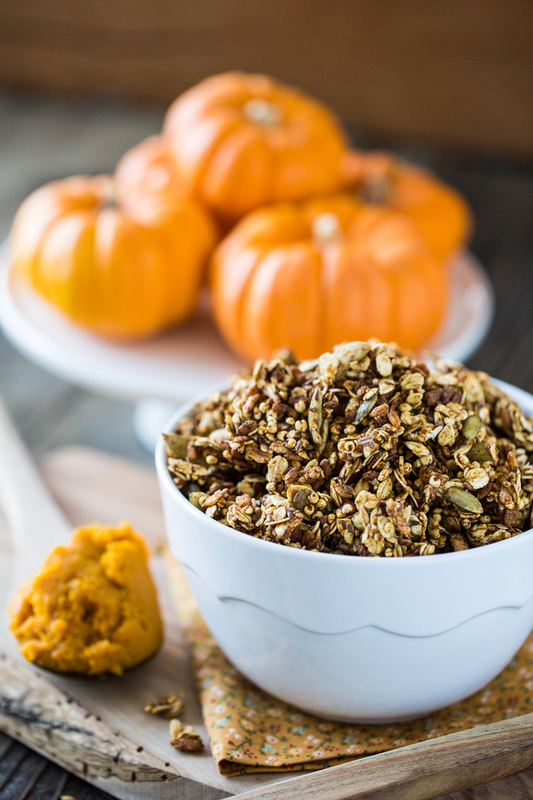 My first attempt into getting into the fall spirit was this Pumpkin Spice Granola. You may have seen it on Friday, topping my Vanilla Pumpkin Protein Smoothie Bowl. That was a big ol’ bowl of Fall. While we were away, we had a housesitter and naturally he and his girlfriend stored their own food in our cabinets. When we got back, I was going through the cabinets, gathering their food, and I came face to face with a can of pumpkin. The can of pumpkin looked at me like “Hey, old friend! Ready to party for the next few months?” I was like “Uh, what do you mean? It’s still summ- Oh.” I reluctantly pulled the can of pumpkin out and set it on the counter so I wouldn’t forget it was there (as I had for the past year) then went to the store and bought the last carton of Summer’s strawberries I could find. I was in denial. The Pumpkin Can sat there for about a week while I brainstormed pumpkin recipe ideas. 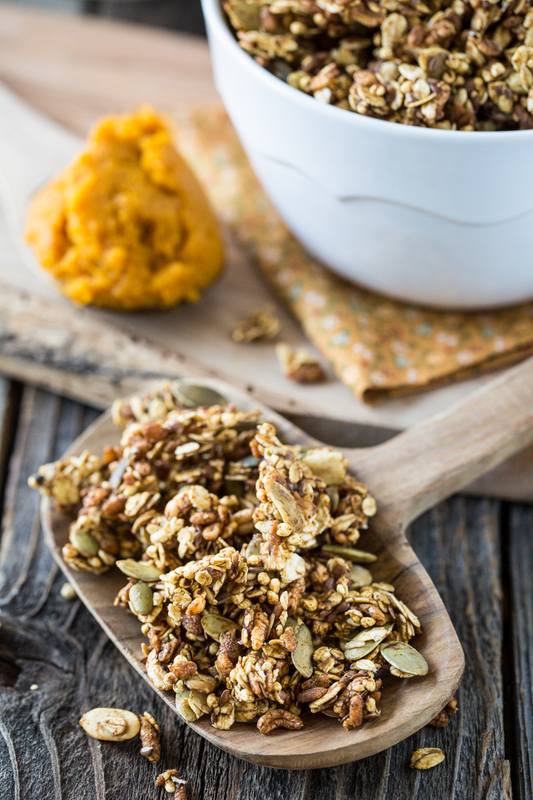 I remembered one idea I’d had last year but never got around to trying it- pumpkin granola. A few shakes of cinnamon later, I had two baking sheets full of the tastiest pumpkin granola I’ve ever had and my house smelled AH-mazing. Seriously- If you don’t make this for the granola, make it for the way your house will smell afterwards. I dont’ like overly sweet cereal, so this granola is only mildly sweet. You could definitely up the maple syrup to 1/3 cup if you’d like, or add in some coconut sugar for a little extra sweetness. It’s crunchy, it’s pumpkiny, it’s spicy, but the little pumpkin seeds throughout are probably my favorite thing about it. 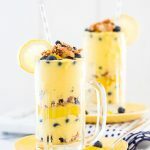 It’s perfect on top of smoothies, yogurt or ice-cream (Note to self- try this on top of ice cream ASAP), and it’s absolutely dreamy floating in a bowl of almond milk. 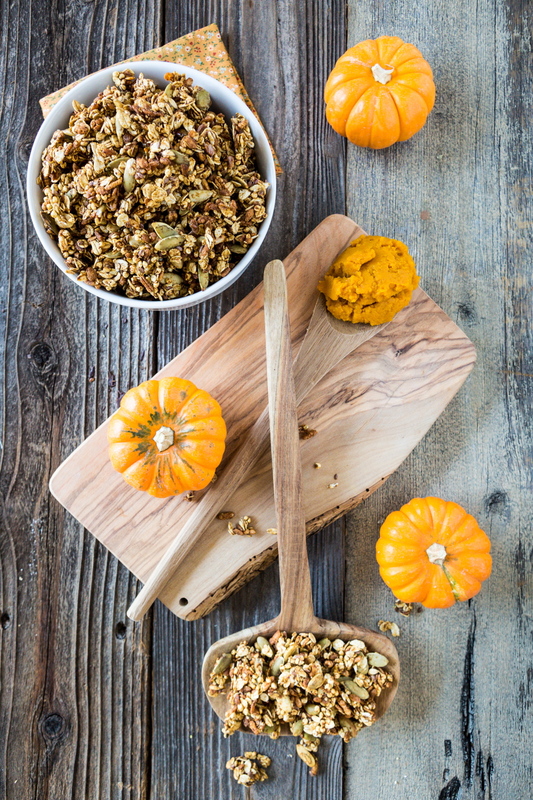 The almond milk gets a little cinnamony and sweet and makes for the perfect accompaniment to this pumpkin granola. Ready for Fall? Pour yourself a bowl. Bake the granola for 45 minutes, switching shelves for each sheet (i.e. placing the sheet from the top shelf on the lower shelf and vice versa). Once done, let cool completely before transferring to an air-tight container. Enjoy! By the way, I have two giveaways going on- The Fork & Beans Halloween Special E-Book Giveaway and the Vega Starter Kit Giveaway. Have you entered yet? Are you getting into the spirit of Fall yet? 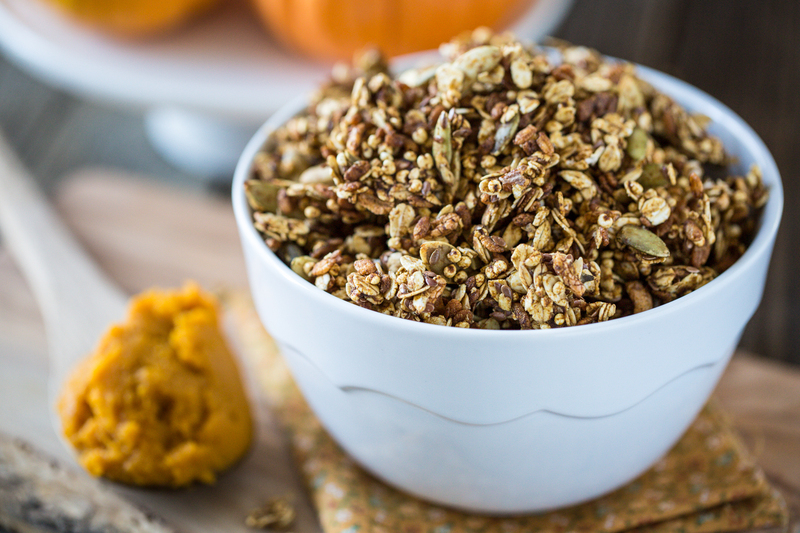 19 Responses to "Pumpkin Spice Granola"
p.s. loving the mini pumpkins, they are soooo cute! That looks so good! I make granola every week, so this will be my next batch, once I find the puffed millet and kamut. Cute Kristy! Welcome to fall!!! 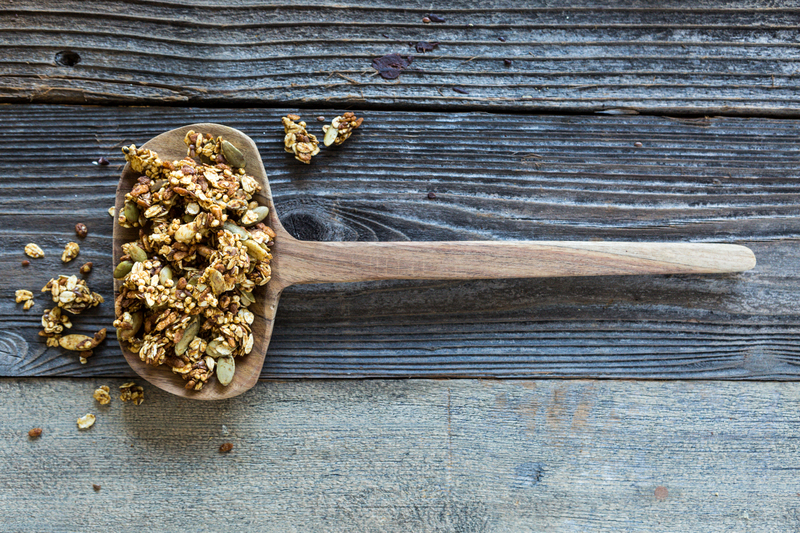 Love that, this granola looks amazing. Loving everything squash these days…my fave time of year by far! Yum!! I love that this is different than the usual pumpkin type things that are popping up! 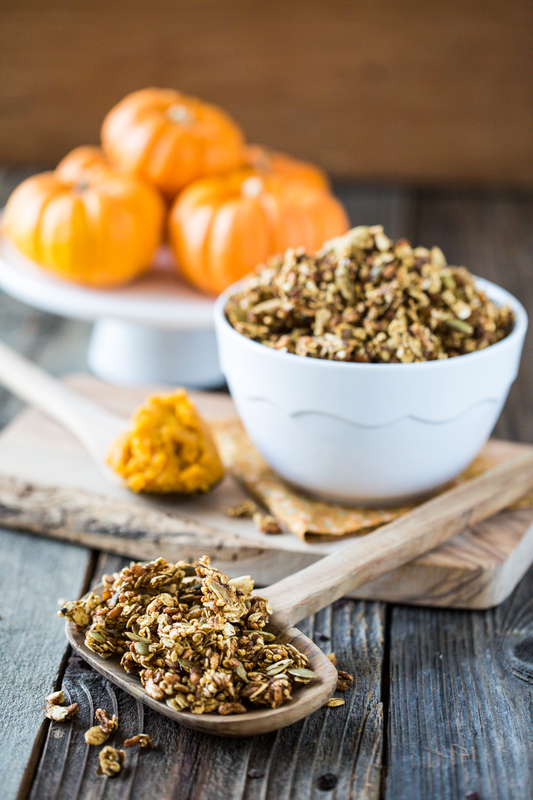 I love that this granola actually has real pumpkin in it – so many of them only have the spices! 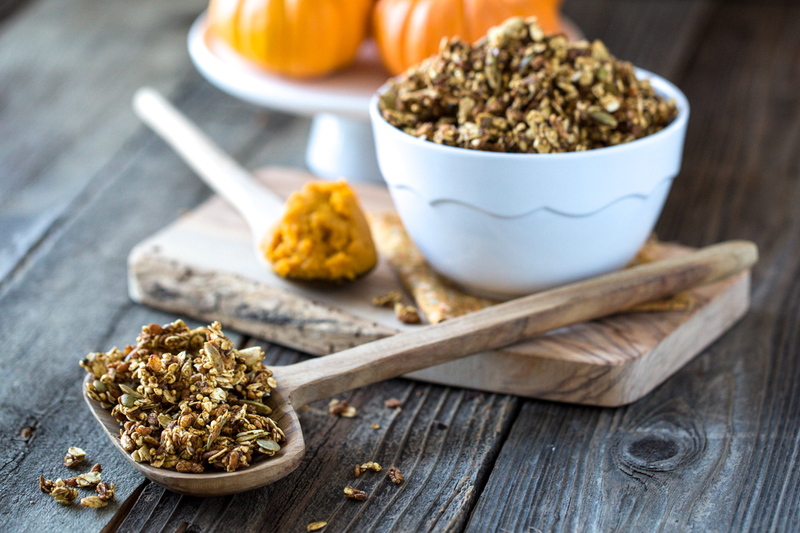 I can’t wait to try this – I LOVE pumpkin anything and I definitely love granola! Thanks for sharing! 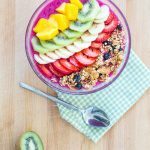 Maria Tadic recently posted…10 Quick & Easy Diet Fixes! I hunted down pumpkin puree in Stirling, Scotland. It’s a pretty foreign thing in the UK. I was asked many times in various stores to repeat my query and then got the usual ‘Pumpkin puree?’ and raised eyebrows. But I finally found some. And it costs £2 per can!!! Might try eBay next time. you can always just buy a pumpkin or orange squash (like acorn or butternut) and roast/puree it yourself 🙂 Loads cheaper. Kammie @ Sensual Appeal recently posted…The most amazing Health Bundle EVER! I am no different than every other pumpkin lover this fall. I fear making a full sized batch, for I will probably eat the entire thing in one sitting. This sounds wonderful and I will definitely be making this weekend!! Any idea on nutritional info? Calories and fat specifically. 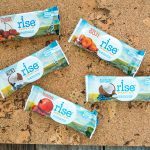 Thank you for posting – great recipe! Holy crap Kristy! This looks incredible. I made your Pumpkin Pie smoothie the other day (I added spinach) and it was delicious! I totally agree that the pumpkin seeds are the best part, I can eat them by the handful. I ended up making this last night without the puffed millet and puffed kamut and used raw buckwheat groats instead, and I subbed milled chia seeds for the flaxseeds, and added jumbo raisins. It turned out great! 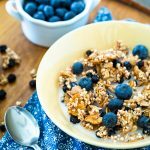 That granola looks super gorgeous! 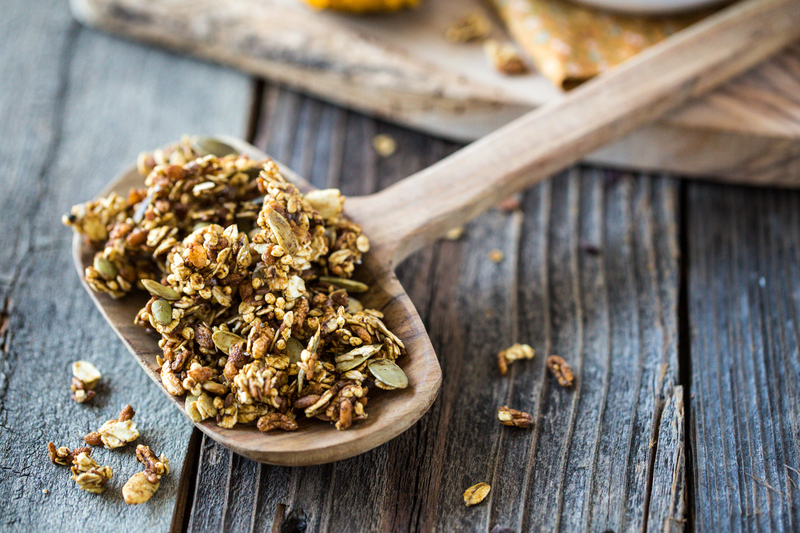 I made this granola this weekend with the last of my pumpkin puree from the fall, and it is seriously fantastic! Definitely a keeper. Thanks for sharing the recipe, Kristy! Wow! I made this yesterday and it blew me away. Actually tasted as good as it smelled while in the oven! You are a genius.